﻿"Passion for learning. Excellence for all." Mission: We empower students to become responsible citizens in a global society. Early student check out will end at 3:00pm each day. When necessary, please make arrangements to have early check out done prior to 3:00pm. Click the image below for access to digital resources to keep your mind sharp and avoid boredom this Summer! ​THINK ABOUT PARTICIPATING IN CEDAR FORK'S BATTLE OF THE BOOKS TEAM NEXT SCHOOL YEAR (2016-17). Linked Here IS THE LIST OF BOOKS FOR THE 2016-2017 BATTLE OF THE BOOKS. YOU CAN START READING THIS SUMMER! QUESTIONS? MRS. VOGT AND MS. THOMPSON WILL HAVE AN INFORMATIONAL MEETING IN SEPTEMBER, 2016. Click Here for important information about your child's Kindergarten year. Keeping our Bus Riders safe...​click here to see what is being done to ensure the safety of our bus riders! Have you met your reading goals? Be sure to continue reading a few good books...keep up with that Reading Challenge!!! AIG Nomination Windows are now closed. Please do not drop-off your child before 8:45 AM as there is no supervision. Transportation changes should be called in to the office before 3:00 PM. Please do not sign out your child after 3:15 PM. Wondering when your child has PE? The specials schedule by class for 2015-2016 is now posted under Parent Resources. If a class is split for specials, you will need to check with your child's teacher to determine with which class he/she has been assigned. A series of free skill-building classes, workshops and educational events aimed at helping families learn to engage with the school system and contribute positively to their child's academic and social success. New bus routes will be posted on the WCPSS web site on Friday, August 19th. If you are a transfer student at CFES, you will have to provide transportation for the first 30 school days and reapply for bus service. Transportation will also be calling families via SchoolMessenger and using social media to communicate. Click on the presentation links below to view the work the teachers presented at Quarter Three Curriculum Night! ​Congratulations to our Instructional Assistant of the Year, Ms. Marnie Perko! student work led by Ms. Gloria Lee, one of our AIG Teachers! 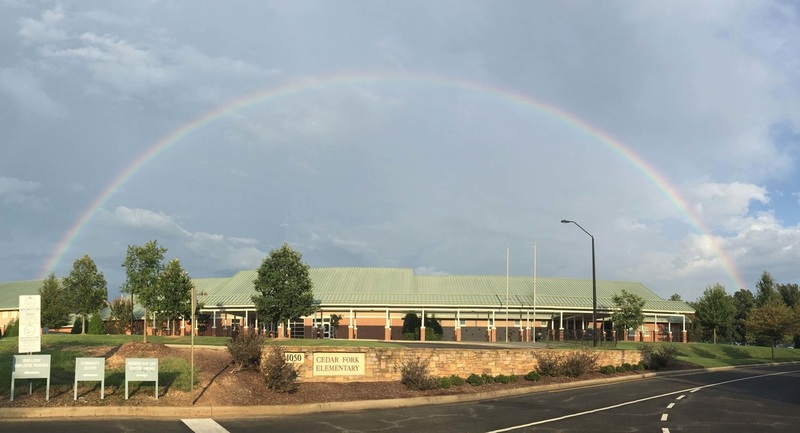 Thank you to second grade teacher, Ms. Wolfe, for submitting this beautiful photo of Cedar Fork under the rainbow last week! We are truly "golden" to be found at both ends! Check out the new Cedar Fork PE blog! It has great ideas for how to stay active! Please visit the Stingray Academy website for important information!